These lounge pants are 100 percent cotton and fail to meet the children's sleepwear flammability standards, posing a risk of burn injury to children. These garments were not labeled or marketed as sleepwear, but because they are children's loungewear, they must meet the children's sleepwear flammability standards. This recall involves about 78,000 sets of children's flannel lounge pants. 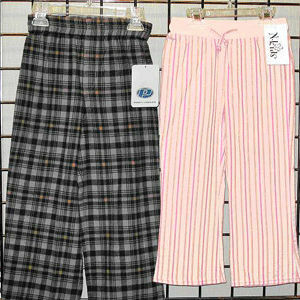 The girl's recalled drawstring flannel pants were available in assorted plaids and stripes. The girl's pants have "N-Kids" and the boy's pants have "Pine Peak Blues" printed on the inside rear waist tag of the pants. Nordstrom, in its stores and on its Web site nationwide from July 2005 through December 2005 for between $12 and $18 depending on size and style. Stop using these children's loungewear pants immediately and return them to Nordstrom.com or to any Nordstrom store for a full refund. For more information, contact Nordstrom toll-free at (888) 282-6060 anytime, e-mail contact@nordstrom.com, or visit www.nordstrom.com.